A quick post this morning with a couple of cards I have made with another of Francoise's new stamps - Woodware Tall Vase Clear Magic Singles FRS303. There are wording stamps included with this stamp too. The stamp design fits well on a DL sized card. 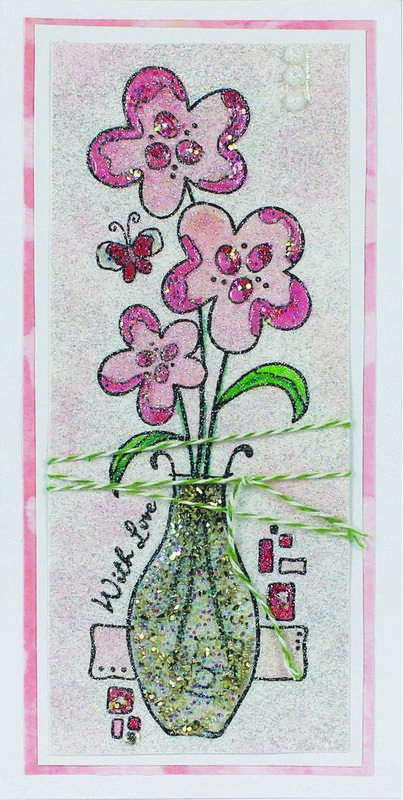 I used the With Love wording on the card above and shaped it to fit the shape of the vase before stamping onto the card. I then coloured the image with pencils and inks, (the inks match the background panel made using a stencil). I placed double sided sticky sheet over the entire main panel and covered it in glitter. I added dimension with glossy accents to various areas, including the vase. I sprinkled Stampendous Champagne glitter glass into the glossy accents on the vase to add a different texture element. I finished it off with a wrap of green and white Woodware twine. It does look better in real life, the glitter and dimension do not show in the photo. 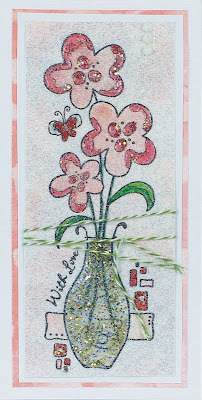 I paper pieced this card adding another of the wording stamps as a panel at the side.